Lately, my dinners have become a real embarrassment. Coming home exhausted from work, I've been prone to indiscriminate refrigerator foraging. We've all been there. Slowly cranking the can opener and picking away at oily tuna or pouring an extra generous bowl of cereal. The other night I bottomed out ravaging a small filet of cold salmon followed by cereal and a scoop of ice cream. It was a real culinary low point. In search of flavor forgiveness, I decided to make a meal so good it would erase the memory of my fish and dairy frenzy--a redemption supper. With my weekly trip to the market taken care of, a light, summer pasta seemed like a solid call. I began by rubbing a chicken breast with olive oil and seasoning it generously with kosher salt and freshly cracked pepper. While the bird roasted, I chopped up a quick pea and pistachio pesto, before tossing in thin medallions of roasted chicken, lemony, crumbled ricotta, penne and chopped pistachios for a meal that put me back on the straight and narrow. Mince a small portion of the peas with the garlic. Continue to incorporate the rest of the peas, parmesan and pistachios and chop until the mixture is completely minced and there are no big chunks of peas left. Transfer the pesto to a bowl and top with 3 tablespoons of olive oil, cover and refrigerate. In a separate bowl, combine the ricotta, lemon zest and a pinch of salt. Preheat the oven to 350 degrees F. Line a baking sheet with foil and rub the chicken breast with olive oil and season with kosher salt and freshly cracked pepper on both sides. Roast the chicken for 35 minutes, remove from the oven and cool. Remove the skin and slice the chicken into 1/4 inch medallions. Set aside 1/2 the chicken and store the rest in the refrigerator. Cook the pasta according to package instructions. 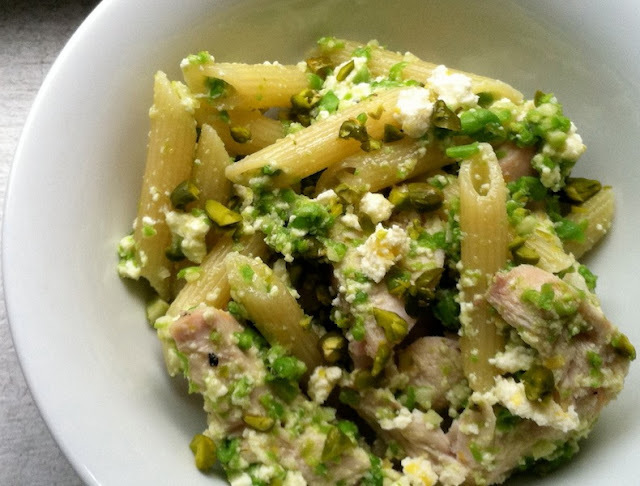 Drain and toss with 1/2 the roasted chicken, 2 tablespoons of the ricotta mixture and 2 tablespoons of pesto. Garnish with a tablespoon of chopped pistachios.